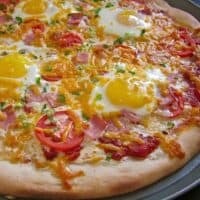 A classic pizza crust topped with red sauce, cheese, ham, and egg makes for the most deliciously filling breakfast pizza! If using frozen pizza dough, allow it to come to room temperature before stretching it into shape (it is much more cooperative at room temp). While the dough is thawing, slice the tomato, green onion and dice the ham. Preheat the oven to 450 degrees. Spray a perforated pizza pan with non-stick spray and sprinkle with corn meal. Stretch the dough into a 16 inch round and place on the pizza pan (here is a video on how to stretch pizza dough). Top the pizza with sauce, half of the cheese, the tomatoes, ham, green onions, eggs and the remaining half of the cheese (I used monterrey jack on the bottom and cheddar on the top). The eggs can either be placed on top whole and raw or pre-scrambled and sprinkled over top. Bake the pizza for about 15 minutes at 450 degrees or until the crust is golden brown and the cheese is melted.